Japanese Episode 045: "Sing! Purin!" English Episode 043: "The Song of Jigglypuff"
Satoshi and his friends have reached Neon Town, a city that's open 24 hours a day seven days a week. The residents of the town are irritable as a result of not getting enough sleep so our heroes retreat to the comparatively peaceful woods nearby. There, they come across a wild Purin who, for some reason, isn't able to sing! 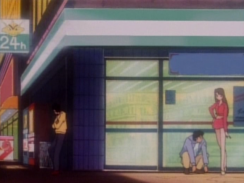 None of the remedies our heroes try work until Takeshi remembers that there's a fruit nearby that's supposed to be able to help soothe sore throats. The remedy works and Purin is able to sing again but now a new problem arises; everyone who listens to it sing falls asleep instantly! Angry that nobody is able to sit through its song all the way until the end, Purin steals a marker from Satoshi's backpack and goes around drawing graffiti on everyone's faces! After our heroes wake up they remember the insomniacs they encountered in Neon Town and wonder if they'll be able to listen to its song. Our heroes return to the city and put Purin up on a big stage where everyone in town can hear it but they just fall asleep instantly! When Satoshi and his friends wake up they find the people of Neon Town, having finally been forced to get a good night's sleep, are now much more friendly than they had been. Purin is nowhere to be found, however, so our heroes have no choice but to continue their journey, wondering if Purin will ever find someone who can listen to its song. The whole Purin "arc," if you want to call it that, is the kind of insane storyline that I feel is quintessential Kanto. It's a simple story - this irritable little balloon just wants to find someone who can listen to its song all the way through - and yet it's a storyline that somehow managed to continue for a good half a decade before (sorta-kinda) getting a resolution! The writers pace the pokemon's appearances out far enough so the formula established here doesn't get run into the ground too much but it's still amazing to think that the story started in this silly little episode would go on to become one of the franchise's longest. 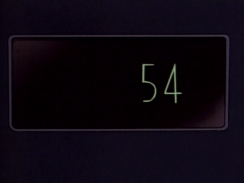 I wonder if this episode's writer had any idea what he was starting when he wrote this episode...? 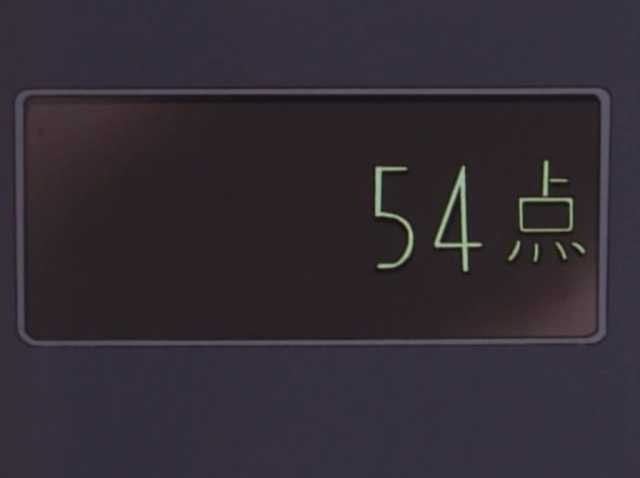 Purin will kind of become a crutch to the writers as the years go on (Don't have an ending to your episode? Just have Purin come in and put everyone to sleep!) but for now I really like it. I even kind of wish Kasumi had caught it in this episode, maybe...? Purin has an actual personality, something this series was still struggling with at this point (Hitodeman, Starmie, pretty much all of Takeshi's pokemon, etc.) and the fact that it has an actual antagonistic relationship with the others is something I would have loved to have seen more of. Part of it, I'm sure, also has to do with the gorgeous animation given to us by Akihiro Tamagawa in this episode that makes everyone seem even more expressive than usual. But every now and then I like to think of how different things have been if Purin had become a regular member of the cast instead of a recurring character. This episode also has the amazing Rocket trio performance with the equally amazing music video but I'll comment more on that in the actual comparison itself. 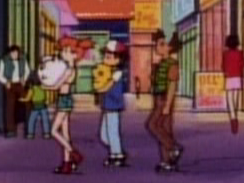 So here's a story from Dogasu's real life that I think you might enjoy: I remember going to an anime convention one year where Rachel Lillis, the voice of Jigglypuff (as well as Misty and Jessie, of course) was one of the guests of honor. I think this was Otakon 1999, maybe...? Anyway, I remember we were about halfway into whatever voice actor panel she was a part of and Rachel Lillis decides to sing the Jigglypuff song for all of us there, live. And as she sang, pretty much everyone in the audience started to fake snore as if they were being put to sleep by her song! Now this was not something that any of us had ever rehearsed beforehand; this was a spontaneous, cute little moment between Ms. Lillis and all these fans of her work. I also remember Rachel Lillis, rather adorably, apologizing to us for her singing, explaining that the version you hear in the show has all these pitch adjustments and other vocal effects added in post-production to make it sound better. But to be honest I don't remember her singing being bad at all. 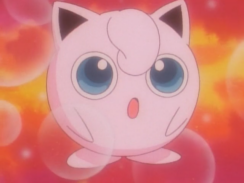 Anyway, the point of that story was that Rachel Lillis is definitely a great singer and so having her voice Jigglypuff is probably one of the best casting decisions 4Kids ever made. 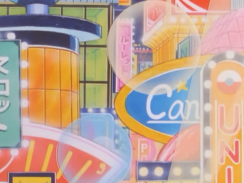 There are a lot of paint edits in this episode thanks to our heroes' visit to Las Vegas Neon Town. The first edited shot has surotto (スロット), or "slots" as well as sutaa (スター), or "star" erased while curiously leaving ruuretto (ルーレット), "roulette" intact. 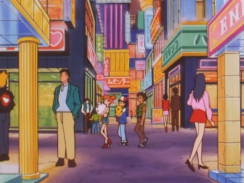 Just like a similar shot before it, koiru (コイル) gets erased from the red sign near the woman's skirt. Now if you watched this episode on DVD or on TV anywhere outside the U.S., then you would have seen the above shot of Jessie being spanked by that larger woman. But if you watched this episode on Kids' WB! when this first aired in the U.S. back in 1999 then you wouldn't have because the above scene was removed entirely and the following close-up of Nyarth standing slack-jawed was extended to cover the time. And thus begins a curious chapter in the Pokêmon dub; the version of the show that aired on Kids' WB! in the U.S. is (slightly) more edited than the version that aired on other networks / in other countries. I guess Kids' WB! 's censors had a problem with an image of an adult woman being spanked, even in what is obviously meant to be a comedic fashion, and so they had the already edited episode changed even further. Since most of the copies of these early episodes out there are of the international version and not of the version that aired on Kids' WB!, documenting exactly which episodes had which additional edits is going to be based almost entirely off of my ability to remember edits from two decades ago. I'll do my best. The script for this episode is actually pretty great for the most part! 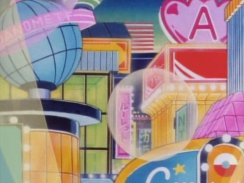 I guess 4Kids figured that if they're going to do so many visual edits in an episode then they might as well have their good script writer onboard to help balance things out? Misty: "I still think it's cute but...who wants a Jigglypuff that can't sing?" In the original version there's a reference here to an old Japanese song that, of course, nobody in the West would have any reason to get. After Satoshi reasons that Purin didn't attack them because it can't sing, Kasumi says "But a canary who forgot how to sing will be carried away in the ocean" (でも、唄を忘れたカナリヤは、たしか海に流されてしまうんじゃ…). The name of the song Kasumi's quoting is The Golden Sparrow (金糸雀 (カナリア)). 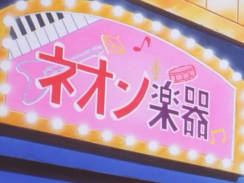 She's basically saying that a Purin who can't sing is like a canary who can't sing; useless. The English version is a tiny bit more harsh than I would have liked but it gets the same meaning across for the most part. And speaking of songs, let's talk about the Rocket trio's big performance in this episode! The song they sing in this episode is a shortened version of Roketto-Dan yo Eien ni (ロケット団よ永遠に), or "The Rocket-Dan Forever," and it was released on CD in Japan the previous December. If this episode hadn't been delayed due to the Pokemon Shock incident then it likely would have debuted on TV-Tokyo in February, a mere two months after the song's release. Which, back then, was actually a pretty decent turn-around! The costumes they're wearing are reminiscent of the old-timey outfits people used to wear to uta-gassen (歌合戦), or "singing contests" in Japan. The hat, the short cape things, the gloves, all of that. Nowadays people just wear Western-style suits / dresses to these big events (with eccentrics like Sachiko Kobayashi being an exception) but for a while the clothes the Rocket trio wears here were the norm for those kinds of events. The English version, thankfully, decides to do an English language cover of the song rather than write an entirely new tune and awkwardly trying to place it over the original music video. Musashi and Kojirou: "If darkness covers the ends of the universe let's shine our light for it. Run! Sparkle! We'll show you how we shine!" Jessie and James: "You know us as Team Rocket and we fight for what is wrong. 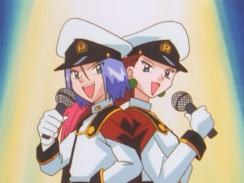 We're tired of our motto so we thought we'd try a song"
Jessie and James: "The speed of light, prepare to fight!" Nyarth: "What is this nya?" 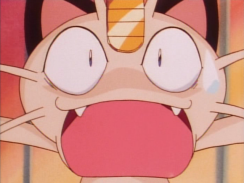 Meowth: "Meowth, that's right~!" Kojirou: "Is love the same as justice? James: "I am the handsome one!" Musashi: "Is justice the same as evil? Jessie: "I'm the gorgeous one!" Rocket-Dan: "Take a look at the drama we're starring in. The age of pokemon has a tomorrow" Team Rocket: "We want to capture Pikachu, we hope to do it soon. And when we do we'll be the new stars of this...cartoon~!" The 4Kids version isn't a translation of the original in any sense of the word but it's still a delightfully goofy song nonetheless. And, all things considered, that's probably the best we could hope for right? 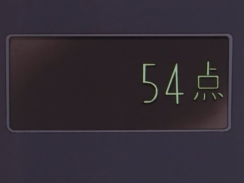 The show of the karaoke machine's final score gets the ten (点), or "points" symbol removed. 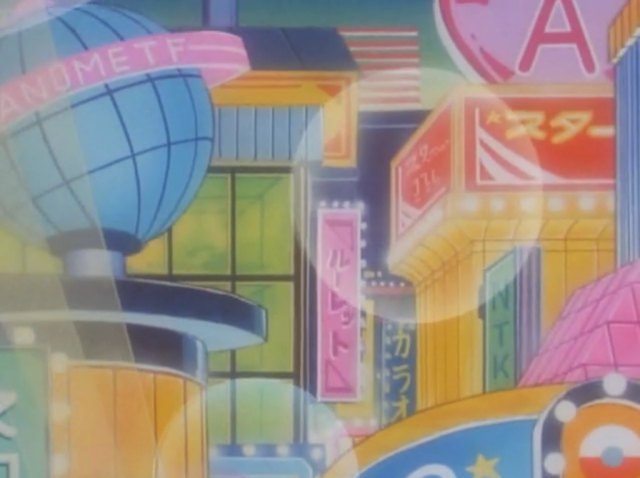 The dub doesn't make it super clear that the Rocket trio's performance is mean to be bad karaoke. While in the Japanese version Megumi Hayashibara and Shinichirou Miki put on their best "bad singing" voices and their voices echo loudly as they sing into the microphones, the English version plays their performance more or less straight. The Japanese version also specifically says that what they're doing is karaoke while the English version, for some reason, has this weird aversion to using the word. 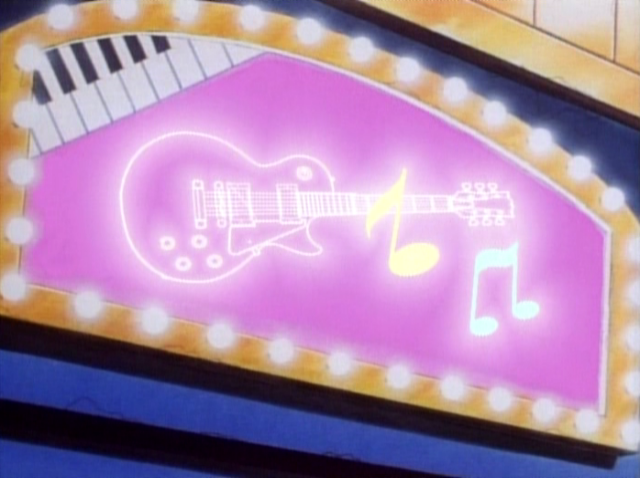 Misty: "Do re mi fa so la ti do~ Do ti la so fa mi re do~ Like that, see how I control my breathing as I sing the notes?" 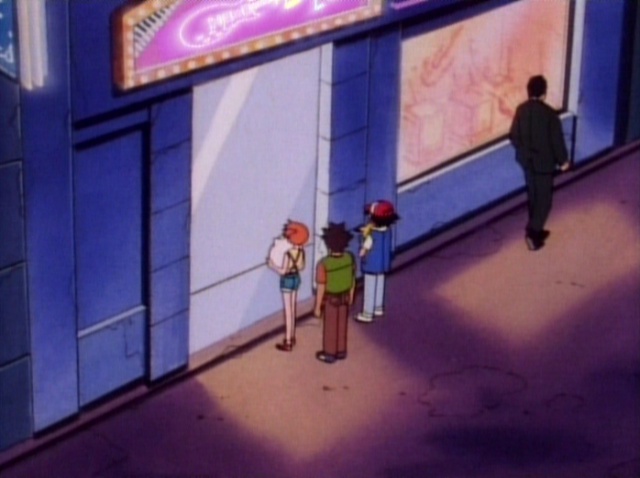 Ash: "You're a great voice teacher, Misty." 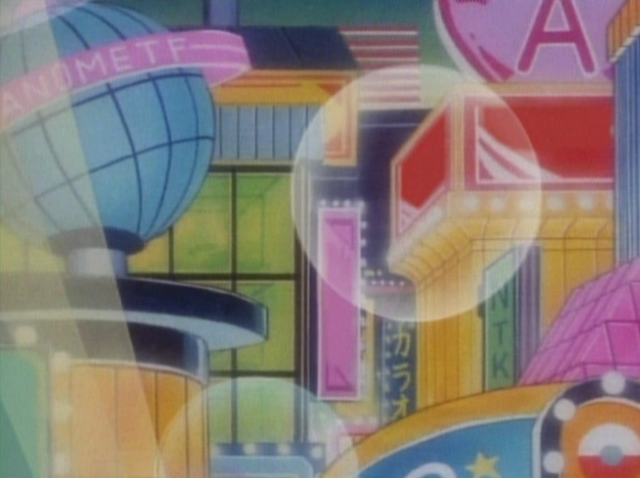 This episode introduces us to Jigglypuff's song. The song has the same melody as the Japanese version, which is nice, and Rachel Lillis does a remarkable job of sounding like an English version of Mika Kanai regardless of whether or not that was her goal. 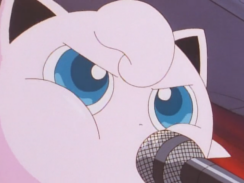 The only criticism I have - and this has nothing to do with the song or its performer, really - is the inherit awkwardness present in Jigglypuff's name. I know this is a super pedantic thing to bring up but it's kind of hard for me to watch this episode and not think about this kind of thing. This shot has the typical cover-ups; words like "game center" (ゲームセンター) and "pachinko" (パチンコ) get erased, and...waitaminute...what's going on with Brock's head there in the English version? Can we zoom in on that please? Oh my God what is happening here!? Is the very fabric of time and space collapsing right on top of poor Brock's head!?!? Why is this happening!?!?!? HOW IS EVERYONE REMAINING SO CALM!?!?!?!?!?!? This Neon Gakki (ネオン楽器), or "Neon Instruments" shop, has the honor of being the only sign in this entire episode that actually gets something added to it instead of just being left blank. I guess the only reason 4Kids bothered is because of the establishing shot at the top there (focusing the camera on a blank sign is too ridiculous, even for 4Kids), though they've done that sort of thing before too so I don't know. The Japanese version also has some The Simpsons-type sign-based jokes, something I believe this series has only ever done in this one episode and this one episode only! The convenience store at the top is called Seven Eleboo (セブンエレブー), an obvious parody of the Seven-Eleven chain of convenience stores and a joke that could absolutely have been rendered in English as Seven-Electabuzz if 4Kids had put in the effort. There's also a blue sign in the shot that says oden (おでん) that gets its text erased. 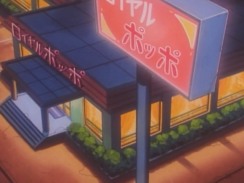 As for the bottom picture, the family diner-type restaurant is called Royal Poppo (ロイヤルポッポ), a parody of the Japanese restaurant chain Royal Host. 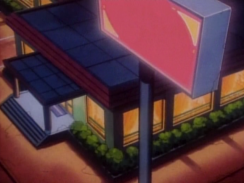 This one wouldn't have been as easy to render into English due to Royal Host being a (mostly) Japan-only chain but something as simple as "Neon Diner" would have worked better than "large red box with nothing written on it," right? 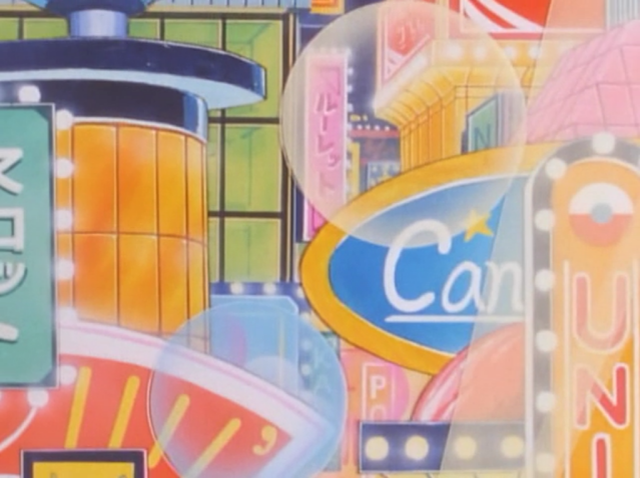 This shot is very similar to the shot from the beginning of the episode except 4Kids actually erases ruuretto (ルーレット), or "roulette," this time around. There are a lot of other paint edits in this episode - I counted eleven shots edited in this second half of the episode alone - so be sure to check out this page showing each and every paint edit made to the episode.